Chandigarh: Dunig a special session of the Punjab Vidhan Sabha on Wednesday the state assembly passed a resolution, directing the state government to take up with the Centre the issue that non-riparian states should pay cost to the state government for using the state’s waters. Congress MLAs were absent during today’s proceedings. SAD (Badal) rebel Pargat Singh and independent MLAs Bains brothers attended this session. BJP leader and Parliamentary Affairs Minister Madan Mohan Mittal proposed the resolution saying there had been instances in the past where the state had demanded royalty and received it. 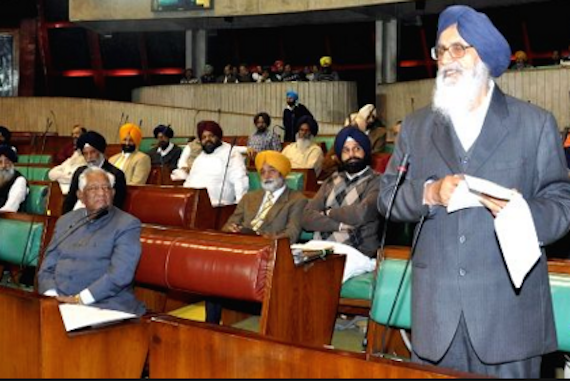 Punjab CM Parkash Sigh Badal addressing the Punjab State Assembly (called Vidhan Sabha) [File Photo]”Initially, the state government was contemplating bringing in the demand of remuneration through a bill–Punjab State Ownership, Utilisation and Imposition of Cess on Water Bill. However, being a money bill, this required a nod from the Governor. The government got indication that the Governor would not give his nod for bringing a money bill in this emergency session”, notes The Tribune. Addressing the session, Bassi Pathana MLA Nirmal Singh said Rajasthan owed the state Rs 80,000 crore as royalty for using state waters. M. M. Mittal reportedly accepted Bains’s argument that the state should charge cost and not royalty. The Vidhan Sabha asked the state government to charge costs to all non-riparian states, for the water sent to these states through the rivers of Punjab. These included Haryana, Rajasthan and Delhi. Punjab is facing severe water shortage crisis as a large amount of its river waters are allocated to non-riparian states of Rajasthan, Delhi and Haryana. In this scenario passing a resolution to seek royalty from other states is a weak step. The situation demands strong political decision directed towards safeguarding future of the state by stopping the outflow of river water to non-riparian states and full control of Punjab over state’s headworks.